Mike: Hey hey what's going on guys, welcome to the active CB passive income podcast. I am super super excited today to have a legend on the show. He’s been a silent mentor of mine. But he's a father, he's husband, he's a real estate investor and he's a former Fox News anchor. But after leaving, I'm sorry after achieving his financial freedom right he left the news industry. now devotes his time to teaching and helping others build passive income and achieving freedom of their own and he also runs one of the largest turnkey companies in the world and I am sorry in the country right. He is the host of one of the most followed podcasts, a real estate investing podcasts and he's a personal mentor of mine. Sir how you doing Clayton it's nice to have you on the show. Clayton: Hey thanks so much for having me and thank you so much for your audience and your service to this country. 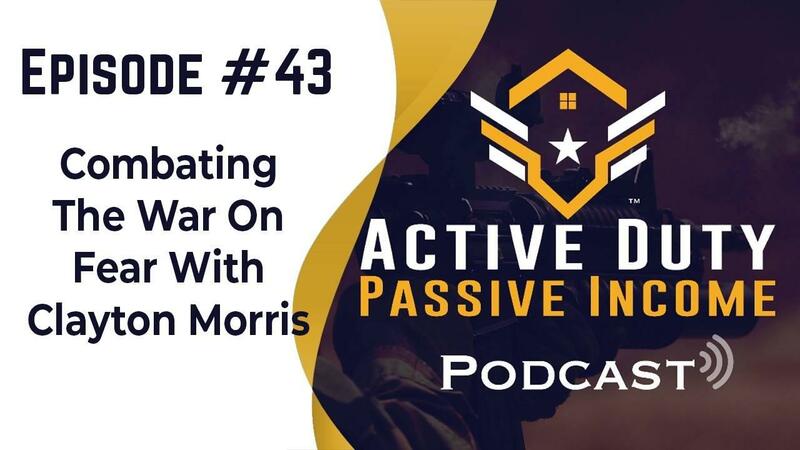 So pleasure is all mine to be here Today to talk about passive income and helping people you know at Morris invest we work with a lot of active-duty military all parts of the world who want a better life for their kids and their family, build up passive income and create cash flow. So it's a true pleasure to be on your show. Mike: Thank you so much, it's a pleasure to have you and so I'm really excited to get into it. But can you tell us a little bit about your background and how you got started. Clayton: Sure so you know I grew up with a lot of fears around money in my family you know as a young kid I would hear constantly in our family you know money doesn't grow on trees, we're not the Rockefellers, we can't afford that and so money for me was always a negative you know I had all these negative associations with money and that's why it's incredibly important about the way in which we talk about money around our children. So now with our children, even though I struggled with that for so many years. We really try to think about wealth building in our family and talking about abundance and money really cash is really just a manifestation of our mindset. It really is true. So I really struggled for a long part of my life you know with this meme around negativity associated with money and it honestly wasn't until I really flipped that switch and I started to journal about it every day, I started to sort of sit down and think about it in my meditations and in prayers and so forth, that money would flow to me, that prosperity would flow to me. Because if you are out of alignment with that it's not going to come to you. like money's going to flow to those who are going to be good stewards of it and going to take good care of it. So if you have a negative association with money where you don't think you're worthy of it, it's not going to come to you. So that's kind of my background. it's kind of where I come from you know and then I started in the TV business when I was after college and moved across the country making no money, you know these small market TV markets like in Montana as a political reporter for CBS affiliate up there and then West Virginia and you know during those times I would read finance books, I read Rich Dad Poor Dad and you know yeah and I have to pinch myself. Because you know it's like I'm friends with Robert Kiyosaki. like he's a personal friend and it's like the craziest thing in the world to me, I have to sort of pinch myself about it and you know but so that's kind of my background as I was making my way through the TV world was how can I change this mental paradigm around money to start to make a better life for myself. Mike: Wow that's incredible and it's so true. You know I kind of had that very similar you know past. I really was like this taboo you know to talk about money you know in the family. It was disrespectful. I come from a Jamaican background. so everyone is very very you know hey I'm not going to say stingy with money, but it just became this thing that no one would ever want to talk about and it was disrespectful to ask people about their finances and have that conversation at the dinner table. Clayton: Yeah it sticks with you. I mean you know and it also informs the way you live your life. Like if you think of yourself as a $60,000 a year person, you act like a $60,000 a year person. How does the person who makes 5 million dollars a year walk, talk, act differently than the $60,000 a year person right. So we just launched our financial freedom Academy and one of the modules that we really dive deep into is this wealth consciousness idea. I'm passionate about it and so is my wife. Because how could you transform your life if you started to act as if you have five million dollars. You know how you would transform your life if you didn't live with this fear mentality, the scarcity mentality. One of the things we teach people to do in the course is to you know just go to a Starbucks right or some place that you normally wouldn't go because you have a scarcity mentality about money. Maybe it's Nordstrom, maybe I don't know what it is right. You go to Starbucks and you would never normally oh my gosh I would never spend $6 on this beverage right or I would never buy a $30 bottle of wine after a long week and you want to celebrate with your spouse. But instead do it, go there and do it and we ask you in the course to really write down like all of the emotions leading up to that purchase. Like I'm not worthy of it. It’s like $30 for a bottle of wine, this is going to be gone in no time. Oh I could you know write down all of those things and then you begin to really see oh my gosh these are the quiet things I'm telling myself every day about money. Mike: That's crazy and I'm sure it would add up to quite a bit. Yeah in my mind for sure. Clayton: You save yourself some money man you know I have my daily Starbucks habit you know and that's the thing you know there was a book a few years ago by David Bach. I think it was called the automatic and he talked about the latte factor in that book and you know it was a catchy thing. I just think it's a crock of crap, to be honest with you. Because what you're going to literally save like three dollars a day by not drinking the thing that you really enjoy and so he's asking you to shrink your life. What I'm asking you to do is to expand your life. Have that latte every day, you deserve it you know. Think abundantly, don't think shrinkage you know, shrink your life down where you can't have a latte, you can't have a thing that you enjoy. No, we want people to live abundantly, you know create prosperity. So that's what we try to teach. Mike: Exactly and to change that mindset. Clayton, I can't tell you how important that is in the military you know to have that mindset shift. Because I mean we are so regimented and so reserved and I think it translates to a lot of areas in our life where it just kind of limits our growth in thinking. I mean I think that the military has this cancer almost right where they think that because they're serving the country, they can't be financially free in it. They have to be a slave to the country and to go out and to you know to not enjoy that prosperity and I think that that mindset you know it never shifts and they get to the point where they transition out. they still don't ever leave that mindset and it ends up you know stagnating their thoughts, their believes you know they go into employment or they can't find employment right and it ends up creating a lot of homelessness, a lot of you know financial struggle. It’s rough. Clayton: Well I hadn't really thought of it that way and I'd love to get into that for your audience. Because you know my heart goes out to people like that who you know you're serving our country. You’ve sacrificed enough. You do not need to now sacrifice abundance for your family. You now need to capitalize on this ability to be in the military, being provided housing, food in many respects right. You’re getting great medical benefits. You have a lot of things going for you. You have the ability to get a mortgage with almost 0% down right. Yeah, so you have incredible tools at your disposal. Now use them right. Now you give a lot because you're giving a lot right. So now take these things and let's dissect them. Let’s really create passive income and financial freedom for our family and you can do it. I know because I've worked with a lot of military families, who bought properties through us at Morris invest or whom we've helped just with our content who've gone out and done certain things. So let's just take the mortgage for example and this is top of mind for me as you were just saying this, I just got like this intuitive hit like let's talk about this. Because this could help your audience tremendously. We spent yesterday in the audio booth recording the audio version of our book. It’s called how to pay off your mortgage in five years. Clayton: Thank you and I think I honestly believe and I wanted to put the book in more people's hands you know who don't have a chance to get a Kindle or read the paperback version but could listen to it. So that's about to come out very soon. But in that book, this is exactly what we talked about and I think it would help the military specifically. Because you're buying a property right, a lot of military families the American dream right want to have their own property. Okay great, you have your own house, now you have zero percent down right. So you've got this mortgage. Now you probably have not much equity in it. But you're also making great money in the military, mostly where you can then you're not having to spend a lot on other things right. You’re able to save on food, you're able to put money away. But what I would suggest is use the strategies in that book and just start firing like a missile at that principle balance of your mortgage. using that extra cash that's sitting there that you can funnel directly at that principle balance on your mortgage if you have a primary residence, if you're not renting and be able to pay that house off in three, four or five years. Now have that massive amount of equity that you can then leverage to go out and buy rental properties and do other things with. But I think military families particularly are uniquely positioned to have some of that extra cash available at the end of the month. Perhaps even better than some other families who might not have that military access? So I would implore your audience maybe check that strategy out. Because I think it could change lives if you really and you guys are focused. 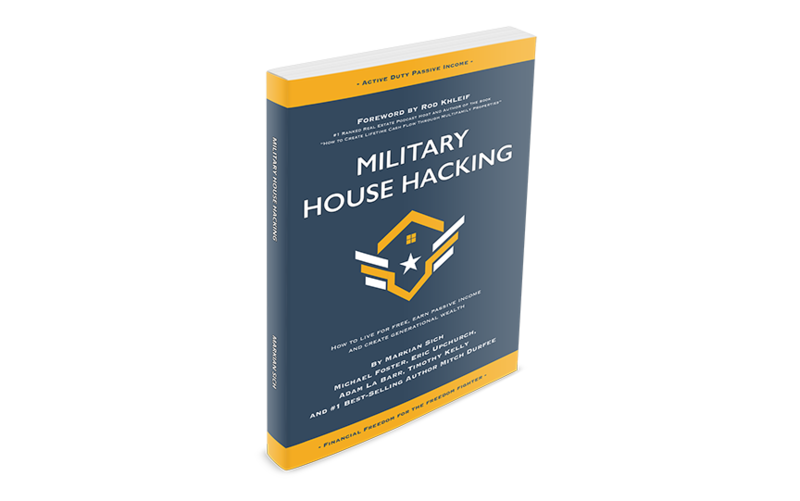 You know you guys are now disciplined and focused and honestly I think I make the point in the book that this is not for a lazy person, this strategy and members of the military are not lazy and they are focused and disciplined and you can follow the strategy and have that mortgage paid off in no time. Mike: Right right right, I absolutely love that book. I remember when you first launched it. I was one of the people that got it as soon. It was amazing, yeah and as a matter of fact, that is actually something that we have you know taught in the past too, you know that strategy. So that book will absolutely be in the show notes page. Guys, you need to go check that out. I mean it is something that can game change you. Especially if you're you know at your next duty station for maybe three years, four years and by the time you roll out you can have a bunch of equity that you can have that home to do whatever with right. So definitely thank you so much and you also mention something to that I think is super important. We have a lot of benefits in the military and a lot of those benefits are not taught right. There’s virtually no financial education. I mean they do a little bit. But they don't impress upon it enough and so that's why our platform exists really. Because we want to get this educate as education as it pertains to real estate you know to get it out there for folks to you know to have it. But since we're on that point, I want to ask you what steps you took you know in forms of cultivating your education to get yourself started on in real estate. I know you mentioned Rich Dad Poor Dad, which is an awesome book. Clayton: Well you know honestly it was the school of hard knocks okay and I think maybe from the military too right, it's learning through doing. You can read so many books. but it's until you actually put it into practice the things start to really happen for you and you going to make mistakes and I think the key is to know right up front that you're going to make mistakes, you're going to get burned by a contractor at some point, you're going to you know have a property management company that doesn't suit you well, you're going to have an eviction at some point; that's part of the game right and if you build that in and know that up front, you won't be disappointed later and frankly it could happen to you on your first property. Great guess what, then you got that out of the way right. You know it could happen to you on your 50th property and then you're experiencing some turbulence. It’s going to happen, you're going to hit turbulence at some point. So just know that it's coming, build it in and just and be okay with that. But for me honestly it started, I think the key for me on this education question is I followed one course of action to completion. It’s so easy to when we have a lot of clients at Morris invest are engineers and they'll joke with us. We’ll get on the phone with them and they'll like yeah I started researching real estate investing two years ago, two years, you spent two years researching all of these different things. Why? Why is it taking you so long? well you know I'm an engineer, so I'm analytical by nature and it's just you know and we joke about it and so they're reading 50 different versions of wealth building. So for me I was on a flight to New Zealand and I had five days to go there. my wife said go ahead, I was going to go shoot photos with a friend of mine who is one of the great photographers in the world and he lives there. So he invited me. I'm on this flight and after a 16-hour flight, I'm sitting next to this couple and they were you know they weren't retired. But they were in their like their 50s or something and we got to talk and after 16 hours and I wish I had talked to them earlier and they said how long you going to be in New Zealand? I said oh five days, I have to get back to work and you know I said oh what about you guys? How long going to be in New Zealand? They said oh we're going to be here for two months. I said two months? What do you do that you can go to New Zealand for two months? You’re not retired and he looked at me he said I am a real estate investor and we're on now descending you know I was so mad. I was I got a piece of paper and I'm like okay how? You know and he said well my partner and I, we buy single-family properties in the Midwest. He told me specific towns. He said we like blue-collar, hard-working lieutenants in our properties. Because they stay consistently cash flowing. He said avoid class neighborhoods at all costs. You’ll get a class headaches, you'll pay too much. There’s more volatility etc. he said don't over upgrade properties. Don’t spend you know get them rent ready. But don't go crazy, you don't have to put in granite countertops and Nest Learning Thermostat and everything. Get them rent ready, so it's a nice property for a tenant and don't fall in love with real estate. that was just other he said fall in love with ROI and honestly I got back and a week later I bought two properties in the same area of Michigan that he had bought in and I never looked back. So I used this same formula that he taught me on that plane. I didn't divert from it and the only times I ever kind of got into trouble where it was out of my wheelhouse is when I started kind of trying to go off of that path. Well maybe I'll do this multifamily thing or maybe I'll do this land deal and I got off track. But staying true to that one story and how to build wealth using one single family at a time, three-bedroom one-bath you know sixty thousand dollar house. That’s what I've done repeatedly and that's how I've been able to quit my day job. Mike: That's incredible, absolutely incredible. Guys that is literally crucial. Couple awesome things there. Don’t fall in love with the real estate, but fall in love with that return. Clayton: Well because so many people you know will work with new clients who come in and like oh all that one already sold, I love that when it was green and had shutters and it was adorable little bungalow and I'm like yeah but they're all like potato chips. Like every house that we have in our company, they're all the same. You know you buy them for a reason in the same neighborhoods and the same zip codes and same areas. Mike: Well there you go. That's incredible Wow. All right well good stuff, and it's really good. Can you tell us what were some of the biggest challenges you faced you know throughout your journey and how you overcame them. Clayton: That's a good question. I think when I first got started before I actually started buying rental real estate, which is what I started doing when I arrived at Fox News Channel. So I was there, but I hadn't quite and I took this New Zealand flights. That’s when I started buying properties. But before that I was buying like speculative things or doing sort of speculative things that I wouldn't now do and I had bought a property that I live next door to when I lived in Orlando Florida right before the crash. Did all the work myself on this condo, bought it off market. Did the work myself. I get up at 2:30 in the morning to do TV, I get home around noon and I would be in there doing drywall and all sorts of things until like midnight. You know I was like asleep for like two hours. I sold that, made a good profit right before the crash happened and I ended up taking that profit and buying stuff that was outside of my comfort zone. So I took a construction loan out on some golf course community speculative land project in North Carolina. It was like a Phil Nicholson Golf Course thing. They’re building this log. I mean you know and then the crash happened. so the contractors pulled out, Phil Michelson pulled out, the whole thing just collapsed and here I was on the hook for like a hundred and fifty thousand dollar construction loan to this Bank and had to go through foreclosure and it's just a nightmare. But I did that a couple of times during that period. I did something else in Fort Myers Florida in a community where back then you could buy a property for 110,000, turn around and sell it like a week later for a hundred and thirty thousand. So that was the play. It was the appreciation play. So now I never invest for appreciation. Appreciation to me is icing on the cake. I don't know what any of my properties that I own are worth. I mean roughly. But hey if they go up five thousand or down four thousand, I don't care. Because they're still going to say consistently cash flowing. So you think the big lesson challenge was you know I don't invest for appreciation anymore. I don't invest in speculative things that I don't understand or that are contingent upon a whole bunch of other outside factors, like the economy right. The hope and promise of selling this for a hundred and thirty thousand six months from now. A lot can happen between now and then right. We see what's happening right now in the housing market. So it doesn't you know under those circumstances it might not make sense. The Fed could raise rates you know all of those things. So I just stay true to what I'm good at and I don't try to deviate from that. Mike: There you go, exactly and I think you reminded me too with that system you know that you used. Kind of reminded me of the strategies from the millionaire real estate investor. Find that model, an expert model and use that and pick up where they left off. That way you can just accelerate your path to success. Clayton: Yeah the millionaire real estate investor Gary Keller, I mean I love that strategy. Because it's just make sure what you're buying your properties. It was that against all of your leverage points on the property, your taxes, and your expenses that you're at least cash flowing like $100 above that point. So the worst case scenario you can pay back a mortgage, you can do you know pay your expenses, pay your taxes all of those things. For me I like to be about a $200 above that point. But it's a great strategy and you just consistently stick to that one course of action towards success. Mike: Right that is awesome, incredible. So tell us now Clayton, where are you now in your career. I mean I kind of loot it too a little bit in the intro. But now you've got so much going on. Clayton: Well it's weird because you know a little over a year ago I retired at 40 years old from the TV business. I was in there for 18 years. mostly in mourning television all over the country in the last 10 years at the network and while I was at Fox News Channel you know I was buying single-family rentals, my wife and I and building up our portfolio of properties. Doing exactly what I learned on that New Zealand flight and was able to get to the point where I was making way more money from my rentals than I was in my day job and our company Morris invest you know we help people who want to buy rental properties, who don't have the time to go out and find off market properties, hire contractors, do all the work themselves, find property management. So we're kind of like a wedding planner like sure you couldn't plan your own wedding, but we do it all for you. You know if you're living overseas you know we'll take care all of it and then you own the property free and clear and it just cash flows and you get to rinse and repeat. So we kind of built those two things up. our portfolio, but also Morris invest and now we're looking to kind of, I think we've been in the weeds with real estate investing and this is me being totally transparent with you. like we felt like ok we've really dialed in being able to explain what color paint to do on a parental property where you know how to maximize your return and all of those like pieces, the real nitty gritty stuff and now we kind of wanted to go higher level and help more people. Who might never buy a rental property? But who need that financial education, that financial intelligence that you talked about at the beginning. Which is why you do this show is that we've never got this education. So we decided to launch the financial freedom Academy. which launches any day now in a few days and so we're super excited about that and in that you know we can help people at a sort of a higher level, get a hold of their finances, pay off debt, turn liabilities into performing assets. So for me I'm excited about spreading that message, being able to do that course, be able to travel and speak in front of large groups nationwide and teach what you teach here on this show and try to help other people take hold of their finances. Mike: That is awesome, absolutely awesome. Do you mind if we grab a link to that or whatever it is? Because we can put that on our show notes as well. Clayton: Oh sure yeah it's just it'll be www.financialfreedomacademy.com and we'll get you a link. As soon as it's live we're gearing up, we've got all the bells and whistles built into the modules and getting the transcripts finished now and so it's a lot of building of the backend website and all the pieces to make sure that the community is strong. Because they'll be a private community, a private Facebook group for those people who are in the course. So we'll be able to go live to those people. Natalie and I also have live streams just for the people in the course to kind of help them through things they're working on and take hold of their finances. So yeah we'll make sure we get you a link to that and go from there. Mike: That's incredible, thank you so much and yes love to promote that. Because that's amazing and it's like you said that mindset shift right is super important. Do you mind if I ask you to like, can you walk us through just whatever was going on in your mind maybe when you transition from your day job to financial freedom. Like how did you make that shift? Big step. Clayton: Well that's a great question and it's if I can get a little vulnerable here for a minute about it. You know I was questioning in the five six seven months leading up to me leaving, why I was still there. So I had just signed a new contract with Fox and it was another three-year contract. But in that world you're only as good as your you know next contract. It’s still a paycheck job. yes you're on the network in front of 2 million people and yes you've got this pretty high profile job and yes you get to interview the President of the United States and yes all of that and it's nice right. But it's still a paycheck and I was asking myself okay if now from my portfolio of rental properties and Morris invest, like we are far exceeding what we're doing here in TV and I don't get to even on that show talk about the things that I want to talk about. Which is what I'm talking about with you right now. I would never be able to talk for an hour on Fox and Friends about financial freedom and helping people build wealth. Like right we'd be up against a commercial, we'd only have four minutes. I'd have to interview this senator about something stupid that she said or you know or Trump tweeted this, so I got to talk about that now. You know so now I can on my YouTube channel and my podcast and my books and talking to you, like I hope help people. Like you're helping people by doing this show right. You’re helping people change the course of their life and it's up to the people watching now to take action and do it. So in those months leading up I was really wondering why am I still here and I think I was thinking well it's not money, is it prestige? I don't know and then really the only answer was ego. I was like you know I guess I'm here because I think my ego is sort of tied to this idea that Clayton's a TV guy or daddy is a TV guy and you know that's what daddy does, you know he's in TV. You wake up every morning and where's daddy? Oh he's you know in the TV studio. So then I realized it was ego and then once I knew that that light bulb went off, it was easy for me to leave. Because that wasn't a good enough reason anymore to be doing that. I was happy to be able to say you know what I'm happy to turn this job, this chair over to somebody else and walk away from it and it served me, I'm eternally grateful and I'm grateful for the people at Fox News who were gracious to me. But it was time and so yeah it really was at the end sort of ego and I was like no I'm done, I'm done with that. I don't have the ego about it and a lot of my co-anchors were like you're doing what? You’re giving up this job? I mean it's one of six jobs in TV like oh you know Fox and Friends that chair. It’s like a highly sought after job and so a lot of people thought I was crazy. Maybe I was, I don't know. You know walking away from it that day when I drove out of Manhattan, left the 30 rock area and got in my car. They would never take my car. but I loaded up my car with my stuff from my office, my tie, my suits you know paraphernalia from guests over the years that had given me like little plaques and gadgets and things you know. My car was like filled with all this crap. Just drove out of the city, drove through the tunnel and I just had opened up my Sun roof and I was blasting music and I was like I am free. That’s all on me baby. Mike: Wow that had to been so powerful. Oh my goodness. It really resonates. Because I think that a lot of people in the military too have that, I'm not sure you're even sure if it's an ego to be honest. I don't really know what it is. But I know that there's this mindset that they feel like they're stuck, they're tied to the job right or they have to serve the full 20 in order to have even an inkling of financial freedom. But it's not there, you can do more. You have that abundance mindset. Clayton: And you can do it simultaneously you know which is what I was doing. So I was there on the couch anchoring Fox and Friends. But I was also buying single-family properties and you know I mean I learned from a co-host of mine on the Fox Business Network, Stu Varney. He said you know most people don't know that you can borrow from your 401k, not take off, not withdraw from it; but borrow from it and what's the military version of it? So you can borrow from it, it's yours and you pay yourself back. But guess what? You’re paying yourself back, the bank of you and so I started using my Fox 401k to buy rental properties and pay myself back out of my paycheck. I mean you can do it simultaneously. Mike: Clayton tell you I got the biggest, I don't know I just got so much heat one time when I actually taught that on a Facebook video. I can use your TSP to invest in real estate, none of my videos ever got maybe over like maybe 300, 400, 500 views right. One in particular got like 2,000 and it was shared like 20 times. I got hit up by this personal finance thing and everyone was like what? You’re telling them to borrow from their 401k, blasphemous. Like they shouldn't touch it. I'm like what are you talking about? Clayton: No that's great. I mean you get the same heat that I get for talking about the 401k. You know why? Because we've been taught it's worse in the 401k world. It’s really been taught to us that that's a secret cow you just can never touch it. But guess what? You know the average 401k retirement is ninety thousand dollars. If you retire at 59 and a half, you've got 90 thousand dollars in your 401k. Well the average salary in this country is $80,000 okay, a year. So you mean to tell me you're going to live to be 90 or 85 on that ninety thousand dollars a year? Clayton: No way and by the way you're not withdrawing it. So you're not getting any penalties. You’re just loaning it to yourself. Buy a $50,000, $60,000 rental property. now you bought a performing asset that's cash flowing and then you pay that loan back to yourself over two years out of your paycheck and then you rinse and repeat, do it again. Mike: And you're building at a lot much higher interest rate than you probably get on it too. Clayton: Yeah and the people that thing don't even realize that the interest that you are paying on that loan is an interest to yourself. So it's the bank of you. You’re not paying that interest rate to Bank of America. You’re paying it to yourself and here's another little fun nugget out of this is that the government only lets you put in what is it sixteen thousand five hundred year in your retirement account. You can't exceed that in your 401k. Well when you're using this strategy and paying yourself back. Because the interest gets tacked on, you actually can exceed the federal amount that you're allowed to put in every year. So you could conceivably be putting in seventeen or eighteen thousand in your 401k contributing to it. Because you borrowed from it. So it's like a triple whammy. So to those people that say you can't do it they're full of it. Mike: Guys oh please please tell me you're taking notes and if you're driving or you're flying or whatever right, make sure that you go back and listen to this. Because gold, absolute gold. Thank you so much Clayton and thanks for the wisdom that you've given us so far. I really appreciate it. I want to take you into this little bonus round though alright. Because I do this with all my folks that I bring on here for interview. Its three questions and you are a guy that reads a lot. So I'm going to value this myself too. But what is your favorite book? Clayton: Oh that's so hard to pick. I thought a lot about this. But I have to say I think the book that probably changed my life more than any other is not even really a finance book, not a business book. But it's a book about who we are as people and how we should live our lives and it's really two books. Because the first book that he wrote Eckhart Tolle wrote the power of now. His second book was the new earth and so when you read those kind of combine, the power of now is really the groundwork right. When you look at the new earth as it may be more accessible you know book and then Oprah chose it as one of her favorite books of all time. She had him on for like a 12 part series that they did years ago and it was really a mind-blowing sort of video series. You can still find it on YouTube by the way. But the power of now, I mean the amazing thing with Eckhart Tolle is that he was a brilliant guy. he was a professor in England and he was just absolutely miserable and he sort of woke up in the middle of the night one night like 3:00 in the morning and he just felt like he was going to take his own life and in that moment he had the sort of separation. Where he realized it wait a second he's hearing this other like this voice saying take his own life. If I'm hearing that then there's like sort of two versions of all of us right. There’s that ego itself. There’s that that's constantly living in fear of the past or the future and then there's that peaceful version of us that just lives right now, presently. I'm talking to you, I'm not thinking about tomorrow, I'm not thinking about dinner. I'm having this conversation with you. This is where I want to be right now and to live your life like that, even if you only get it in moments just by sitting on a park bench or meditating or in prayer or whatever it is. But trying to have more of those moments. because all of the things that we fear in this world come from some past event as conditioning or some future thing that doesn't even exist and so you know he really walks you through like sort of escaping fear, anxiety all those things. Because none of it actually exists and so I think that book more than anything else. Because I grew up with these fears of money. I grew up with oh my god I'm never going to have enough, I'm never going to be able to provide. All of those things are just garbage. So yeah I would say that. Those books combined the power of now and the new earth are two of the greatest books ever written. Mike: Awesome, that is incredible. Definitely linking that up in the show notes as well guys. So be on the lookout for that as well as that interview with Oprah if I can find it. Clayton: You have to dig for it. it was like in the mid-2000s and it was the first sort of international thing that she did with Skype and all of this stuff and she took each chapter of the new earth and I think it was 12 of them or 10 of them and she spent an hour in each chapter of the course of like a weeklong. So it was really like a training seminar to go through each chapter. So if you can check that out that she did with Eckhart, it's really amazing. Mike: That's cool, definitely will, definitely will. Okay so question number two, who is your biggest hero and why? Clayton: Well honestly I think in the TV world for me it was growing up I have to think about you know maybe it shifted now that I've gotten older. But growing up I wanted to be David Letterman. So I used to sneak downstairs when my parents thought I was in bed and I would watch him after Carson and I just studied everything of his. I mean I was blown away by his ability to communicate through a camera to his audience but also to have fun and no one else had ever done what he did. which was if a cue card guy was off-camera dropped his cue cards and spilled coffee on the stet during the live show instead of ignoring him, he would have the camera guy spin the camera around, they'd make fun of his cue card guy for a few minutes and so for me that changed my life and that was what I tried to do on Fox and Friends. Which was always have fun. If you know if one of our camera guys slipped and did something or you know whatever. instead of ignoring it, I called attention to it and I always loved that his wit and his sarcasm and his speed with which he could you know have a comeback and tell a joke and so I always had a lot of respect for his take on broadcasting and so he was my childhood idol and that's probably why I got into television. Clayton: Yeah I mean he's not on TV or he has his Netflix show now. But he's got this full beard now. I'd be up in the balcony watching his show or you know a couple of times. So I got to see him live. Which was great. Mike: Oh man that had to been exciting, I'm sure. That’s really cool. All right awesome all right Clayton so last question. You’ve already given us so many nuggets and I really appreciate it. But what three if you had to condense down right would you give to those who are looking to get started? Clayton: Well progress not perfection. So you're never going to be perfect. I make mistakes all the time. I've got evictions on a few of my properties right now. I overpaid on certain things. I paid this contractor who disappeared you know. You’re going to make these mistakes. just make progress and the way I look at, sometimes I use a method called the getting things done method of GTD . It's a book by David Allen and it's a productivity resource on how to get things done and what he teaches you to do is like all the stuff that's in your brain, dump it into an inbox okay. Get it out of there, spend an afternoon all of it got a pickup stamps, got a buy a present for my mom's birthday blah blah blah. All put it into a bucket and then you're going to go through and categorize it. Is this something I can do in two minutes? Great call your mom, that's two minute done. Get out of your inbox done. These other items might be a project. Put them into a project called buy first rental property and guess what? It might have 12 steps in there. Cause now it's not going to be just project. Now break it down into those bite-sized steps. What is step one? Well step one is okay I need to do this. Step two is I need to do this. Well then you just start knocking them off one by one. So progress, just take those baby steps. Growing up I always sort of felt like there was a cloud hanging above me when I had all these projects to do in school you know and I feel like I'm overwhelmed. But when you actually just break them down into individual steps, you just do two today, do two tomorrow. Before you know what that whole project is done and complete. So progress not perfection. Also take action okay. You know I want to at the end of every one of my YouTube videos is you know go out there and become a real estate investor, take action, do it. Because you are not going to succeed if you just keep reading or just keep listening or just keep seeing other people doing. You got to take action. So those are two and I think the third and kind of alluded to this earlier. But build in turbulence. So J.Abraham taught me this amazing sales technique years ago and one of his top sales guys he worked with, he really was one of the Chet Holmes that's his name. Chet Holmes I think in his great book, the ultimate sales machine he talks about this. He said most people think they're going to get the sale on the first phone call. If you think that way you'll be a failure. But if you know that actually it takes eight touch points to make a sale, eight touch points. Guess what then you're not disappointed when that person hangs up on you in the first phone or you work with them on that second step. Get them to that second phone call, then third. Maybe you have to meet with them, maybe you have to bring them in, send them some materials and that's the fifth touch point and the sixth. So if you know that it takes eight touch points to make a sale, then you're not going to be disappointed when you get a door slammed in your face on step two. So build in that turbulence. Know that there's going to be turbulence along the way and then you won't be disappointed and that's what we try to, you know we try do and we try to teach our students who are getting started in real estate investing. May be the first one goes nice and smooth for you, that's great. But you're going to have an eviction, you are going to. You are absolutely going to. You’re going to have a contractor that you know disappears or pays you know you pay too much. You’re going to have it. So build it into your thought process and don't be disappointed about it. Mike: Right exactly, that's so powerful Clayton. Understand hey this might end up taking us later than we really plan on. But as long as you go into that with that mindset you won't be disappointed that we're leaving it like 11 o'clock at night you know 12 o'clock at night whatever just to get it done or even sleep it on board you know just because we got to finish it up in the morning. Because we're getting ready the next day right. Gosh man, that is incredible. Clayton thank you so much for your time. This has been absolutely magic and I really do appreciate everything that you do you know out there for America too. You know I mean you run in an amazing business. You’ve been an inspiration to me. You and Natalie have been an inspiration to me and my family, my wife. I don’t have any kids yet. but right now, but I know that when I do have kids you know they will be set off right and I hope that you know our audience here listening is going to take you know amazing notes and take even more incredible action you know and going out there and putting off those fears of money that they might have you know developed over the course their time in the military or just in the course of life. But this has been amazing thank you so much for it. Clayton: Well thank you for having me, my pleasure. Mike: Yeah and how can our guests get in contact with you? Clayton: A couple of ways if you're you know in the video like this or you like podcasts you know just check out our YouTube channel. We’re Morris investors. My last name Morris. Morris invest on YouTube. We’ve also got the podcast. Very generic name, just called the investing in real estate podcast with Clayton Morris. So we've got a lot of tips and strategies there for you to take things to the next level and again yeah we're launching the financial freedom Academy. So that'll be you can find that easily it'll be on www.financialfreedomacademy.com or just on my personal website, links to it on www.claytonmorris.com as well. So I'm easy to find and by the way on our YouTube channel, love our community there. I mean we get so many great questions and I am in there constantly spending time answering those questions about real estate. Hey I have this problem, can you help me with this solution you know and I will jump in there. So that's probably the best way an area where we communicate quite a bit in that space. Mike: Awesome, alright guys well make sure you go out there and check it out. I'll have links to all that stuff here in the show notes as well. So it's easy for you just go on your phone or whatever and click that link and you will be good to go. Alright thanks so much Clayton again. Clayton: Thank you, thanks for having me. Wow what a legend. Oh my goodness man I am so hyped right now, it's insane. If you guys are not motivated to go out there and take action after this interview, I don't know what will man. But I hey you know what stay with us. Because we are going to continue to bring legends on this podcast. I'm devoted to it. Why? Because I know that these people are out there that can inspire you whatever situation you're in. man they'll shake up your way of thinking and you just get you to take that action. So please stay with us, connect with us on Facebook, and connect with us on Integra. Hit up our YouTube channel right. Www.activedutypassiveincome.com. we've got so much stuff going on and we are constantly out there. Just showing you guys how to do it alright. So stay with us man, we love you guys. Thanks so much for everything you guys do out there. I am running out of time, so I'm going to go.